The three-volume set contains 1000 backgammon positions and rollouts for the associated cube action. Each page has a diagram of the position and the output of an Extreme Gammon V2 rollout. There is no additional commentary. 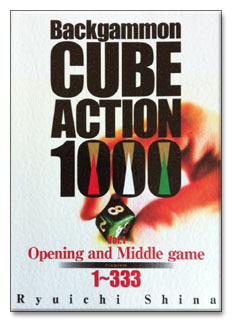 Volume 1 covers opening and early middle game cubes; volume 2 deals with middle game and late middle game cubes; volume 3 has endgame cubes. See these Sample Pages.